Please write “CHRISTINA HO” on the check memo line or in the memo or account field in your online bill payer. Christina’s heart is to befriend and serve international students. She believes God has led her to partner with them to help equip them as disciples of Jesus. She was raised in a big Malaysian-Chinese family who taught her about the love of God for the nations and opened their home for fellowship and Chinese-English Bible study. 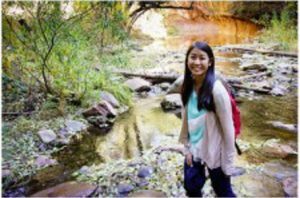 During her pursuit of a degree in linguistics at The University of Arizona, she served in a school club called the International Student Fellowship. It was there that she witnessed the Holy Spirit changing her friends’ lives and mobilizing them to share God’s love with their people at home as well. This experience excited her so much that she wanted to devote the time God has given to her to international student ministry. Christina has been meeting with women to discuss and pray about life issues. She likes to gather with people for meals, basketball games, hikes, and other activities.